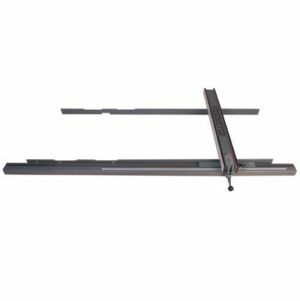 with a sliding table allow the user to move the whole table part - left of the saw blade - backwards and forwards. As the entire table is guided on guidebush rollers even panels of size can be cut easily. Compared to fixed base table saws - the sliding table allows to do cross cuts on wider board width. Most of the time table saws are categorized by the blade diameter. If you hear somebody talking about 10" table saws - it means that the saws blade diameter is 10". Depending on the saw you look at a 10" blade you will get a certain amount of depth of cut. The Delta 2000 Series 10" contractors saw for example, will allow you a depth of cut of up to 3 1/8" in the 90° blade position. If the blade is angled down to 45° you will still get 2 1/8" depth of cut. Whatever kind of table saws you are looking at check maximum depth of cut, not just the blade diameter.As we are into cutting capacity of table saws already, make sure you check the maximum board width for your rip cuts. In other words: How much cutting capacity do I have on the right hand side of the blade, still properly guided by the rip fence. With the Delta saw you get e.g. 30" capacity - which is a lot amongst today's table saws. One of the most important things concerning table saws is the quality of the rip fence. Having seen many different once over the years, I like the Biesemeyer rip fence best. A solid construction with a firm fit along every position of the rail, a fine pointer to read easily and a perfect parallel alignment to the blade, this is what table saws need to have. If you already have a good table saw - check with your dealer if you can attach the Biesemyer Rip Fence to it- it is worth it. Whatever kind of table saw you are looking into make sure that it comes with a precision miter gage. All your cross cutting will depend on this vital part of your saw. A good miter gage should have stops at 45° and 90° and swing to both sides. Notice that I put horse power at the end of my list of important things on saws. The reason is quite simple. 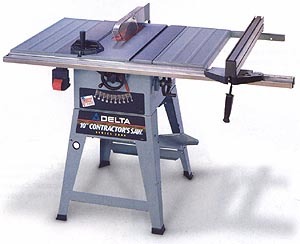 Most tables saws come with plenty of horse power because it is easy to put a big motor underneath a table and call the result a table saw. Make sure that you focus on precision, cutting depth and width and fences before you look for power of a saw.